Anthony James Donegan was born in Glasgow, Scotland, in 1931. His dad was a violinist in the Glasgow-based Scottish National Orchestra. Donegan became a fan of swing jazz and country music as he grew. When he was fourteen he got his first guitar. In the late forties “Tony” Donegan had learned how to play the banjo. Bandleader Chris Barber heard Donegan and had him audition for his Trad Jazz band. Tony Donegan played with the Trad Jazz band for a few years until he was called up for National Service that included three months of military training. While in the National Service in Southampton, England, Donegan played drum in Ken Grinyer’s Wolverines Jazz Band. In 1952 he began the Tony Donegan Jazzband. On June 28, 1952, Donegan’s band opened a concert for Lonnie Johnson at the Royal Festival Hall in London. Johnson was an American jazz and blues singer and pioneer of jazz guitar and jazz violin. Tony Donegan decided to bill himself as Lonnie Donegan in tribute to Lonnie Johnson. Skiffle was a genre with roots in African-American improvisational jug band music in New Orleans. By the 1910’s the word skiffle was slang for a rent party where a band would be hired and a hat would be passed to pay their rent. Instruments in a jug band often included a washboard, empty jugs played with buzzed-lips to produce a trombone-like tone, a washtub bass or gutbucket, cigar-box fiddle, musical saw, comb and paper kazoos, banjo and guitar. The first use of the term skiffle on a recording was in 1925 by Jimmy O’Bryant and his Chicago Skifflers. 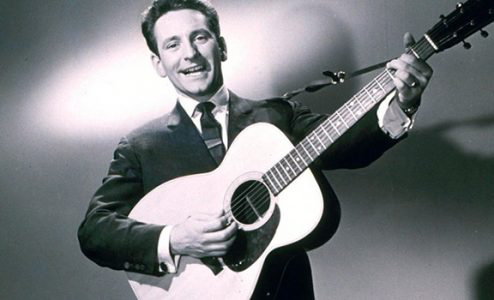 In the late ’50’s and early ’60’s Lonnie Donegan had a string of Top Ten hits in the UK. These include “Stewball”, “The Grand Coulee Dam”, “Tom Dooley” (#3 for Donegan and #5 for the Kingston Trio), “The Battle Of New Orleans” (#2 Donegan and #16 Johnny Horton), “I Wanna Go Home (Wreck Of The John B)” and “Don’t You Rock Me Daddy-O”. He also had three #1 hits beginning with “Cumberland Gap” and “Gamblin’ Man” in 1957 and “My Old Man’s A Dustman” in 1960. The latter was also a #1 hit in Vancouver in 1960. Lonnie Donegan’s skiffle sound inspired John Lennon to form The Quarrymen in 1957 as a skiffle band before they morphed into the Silver Beatles and finally The Beatles. Donegan scored his second Top Ten hit in the USA with “Does Your Chewing Gum Lose Its Flavor (On The Bedpost Overnight)” which was a #3 hit in the UK and peaked at #14 in Vancouver in 1961. The song had first appeared on the Vancouver pop charts in July 1960 with little success. But the positive response it gained in the USA in 1961 put it back on the charts in Vancouver in the fall of the year. 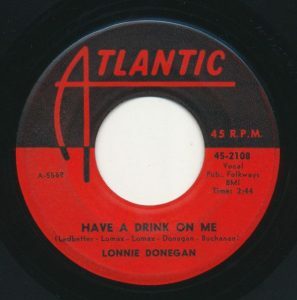 Meanwhile, Lonnie Donegan had another Top Ten hit in Vancouver in the summer of 1961 with “Have A Drink On Me”. “Have A Drink On Me” is a song set in 1888 and concerns an old miner. He goes to a saloon while it’s still morning and offers to buy a round for everyone in the establishment. The miner tells the patrons at the saloon that he’s just inherited an oil well from his dead uncle. It’s ironic, the miner considers, that he nearly died from digging coal in the mines. Meanwhile, his uncle who grew potatoes got rich when he hit an oil well in a potato field. Then the narration of the song builds on the tale of the old miner back in 1888. Lonnie Donegan sings “black gold, yellow gold, Take my tip and give up the mining game….Well sell your shovel and your old long johns, You can make a fortune writing Adam Faith songs.” Adam Faith was a pop singer in the UK who was a contemporary of Lonnie Donegan who had a number of hits on the UK charts. These included his #1 hit from 1959, “What Do You Want” which became a Top Ten hit in Vancouver in March 1960. On the Art of Manliness website, Michael Hagan writes “The tradition of buying your friends and associates a round of drinks actually grew out of the 19th century’s code of hospitality and the honor culture… The code of hospitality dictated that the host always bought the first round of drinks for his guest. But in turn, the guest was then obligated to buy a round for his host.” By having others buy the next round, each person in the group of friends was able to demonstrate their equality. “Have A Drink On Me” climbed to #3 in Vancouver. It peaked at #2 in Winnipeg and #7 in Toronto. In the USA “Have A Drink On Me” climbed to #3 in Port Arthur, Texas. After “Have A Drink On Me” Donegan did a cover of the Highwaymen’s “Michael Row The Boat” which climbed to #6 on the UK charts in 1961. In 1962 his final Top Ten hit in the UK was prophetically titled “The Party’s Over”. He had one more song on the UK charts that decade titled “Pick A Bale Of Cotton” which climbed to #11 later that year. He released seventeen more singles between 1962 and 1976, but none of these appeared on the pop charts on either side of the Atlantic. Lonnie Donegan and the other skiffle recording artists were displaced by The Beatles and the Mersey Beat. As Donegan failed to break back into the charts he saw new recording artists like Gerry and the Pacemakers, Billy J. Kramer And the Dakotas, The Searchers, The Animals, The Honeycombs, The Hollies, The Swinging Blue Jeans, Rolling Stones, The Kings and the Dave Clark Five taking his place. While his skiffle music fell out of fashion, a song he wrote titled “I’ll Never Fall In Love Again” was a hit for Tom Jones in 1967. The song peaked at #2 in the UK and #4 in Vancouver. In the ’70’s he played in the American cabaret circuit. Donegan made a number of albums with Chris Barber in the mid-70’s into the ’80’s. He had a heart attack in 1978. Donegan was part way through a tour in the UK in 2002 when he died on November 3rd of a heart attack. Before he died, Donegan had accepted an invitation to perform at a concert scheduled on November 29, 2002, at the Royal Albert Hall to mark the first anniversary of the death of George Harrison. The Fabulous Forty, CKWX 1130 AM, Vancouver, BC, August 12, 1961. Robin Denselow, “Lonnie Donegan: The Founding Father of British Pop, he Sang his way from Traditional Jazz Through Skiffle Hits to a Novelty Song About Chewing Gum,” Guardian, November 5, 2002. “Lonnie Donegan Obituary,” San Diego Union-Tribune, November 6, 2002. Bob Boilen, “Your Song Changed My Life: Led Zeppelin’s Jimmy Page On Lonnie Donegan,” NPR, April 26, 2016. Patrick Humphries, Lonnie Donegan and the Birth of British Rock & Roll, The Robson Press, 2012. “Irish Pub Culture and Pub Life,” Gaelic Matters.com. Michael Hagan,”Drinks Are on Me! How to Buy a Round at the Bar,” Art of Manliness.com, November 6, 2012.